Thought I'd expand a bit and post the following little pamphlet I inherited from my Grandpa. it's a signed copy, so I assume he knew the author. I've scanned it in at 150dpi and pdf'ed it, so it's a biggish file. it's a great little pamphlet with lots of little anecdotal stories. It'd be interesting to hear if anybody has any info to corroborate any of these or if any of it sparks off any memories of family legends. One thing that would be good to firm up on is whether the fish and ring of the glasgow coat of arms did indeed happen in Hamilton (Cadzow at the time). "What is the good of being a genius if you cannot use it as an excuse for being unemployed?" Good to see someone else interested in Hamilton. Stayed there 99% of my life. Up in Earnock just off the Wellhall Road. Cheers for that. I haven't read it in depth yet, but the ads brought back some memories of long-gone shops. Yes, I'm from Hamilton originally, and my old man still lives just off Bent Road. Glad there's a wee bit of interest in Hamilton. there's lot of history in hamilton it seems, I'd like to know more about the mines in the area and where they were located exactly, any tips? well, cadzow colliery @ cadzow bridge was the deepest in lanarkshire apparently, mentioned in one of the threads linked above. I used to play here as a kid and always wondered exactly what it was. I always assumed it was part of a mine entrance/exit but nobody could tell me exactly what it was. Its just off where the old Dykehead Farm was before West Craigs was built, and up the hill from the "fifty feet" tadpole pond/farm dump. Hmmm... can you pin it down on a map? 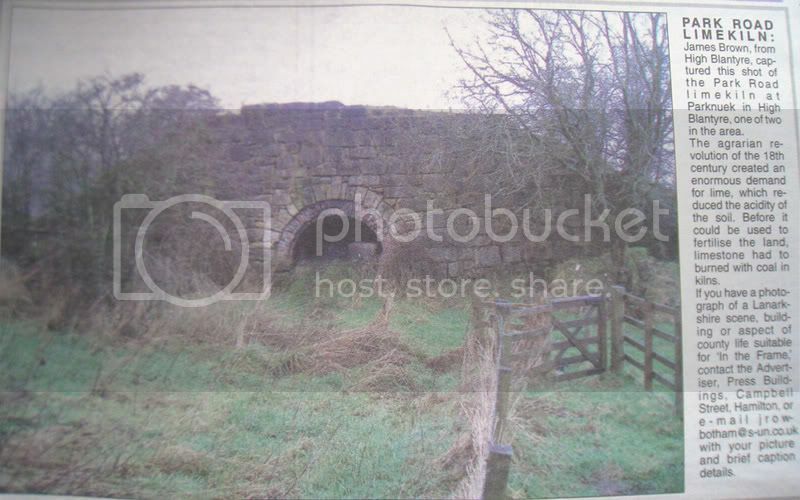 Looks to me like a kiln maybe - there was a picture of one in Blantyre in last week's Hamilton Advertiser, if I can find it kicking about I'll scan it and post it up. From last week's Hamilton Advertiser - apologies for lazily photographing it rather than scanning, couldn't be arsed retrieving scanner from car! gap74 wrote: From last week's Hamilton Advertiser - apologies for lazily photographing it rather than scanning, couldn't be arsed retrieving scanner from car! Quite a fluke that its turned up in the local paper too, cheers!